James “Hondo” Geurts, Assistant Secretary of the Navy, Research, Development and Acquisition, has said that the force is seeking $23 million in funding for its 2020 3D printing efforts. According to Inside Defense, Guerts told the House Armed Services Intelligence, Emerging Threats and Capabilities Subcommittee, that the funds would go toward developing appropriate certification for 3D printed parts, potentially creating a database that groups all the objects together. Furthermore, Guerts added that the Navy foresees an allocation of $66 million to 3D printing as part of the under the Department of Defense (DOD) Future Years Defense Program (FYDP). Updated each year, the FYDP gives a projection of the DOD’s funding, manpower and force structure needs over the next 5 years. The U.S. Armed Forces, and particularly the U.S. Navy, is heavily invested in 3D printing. In 2018 alone, the U.S. Office of Naval Research (ONR) allocated $2.6 million for the introduction of metal additive manufactured parts; Lockheed Martin entered a $5.8 million contract with the force; and, by the end of the year Naval Air Systems Command (NAVAIR) estimated its fleet relied on the use of 1,000 3D printed parts. Most recently, the Marine Corps Systems Command (MCSC) set up an Advanced Manufacturing Operations Cell to provide 24/7 3D printing support, and the Navy has been applying the technology to upgrade various ships in its fleet. This aligns with Guerts annual shipbuilding plan, which was directed to Naval Sea Systems Command (NAVSEA) last year. In this directive, Guerts asked NAVSEA to compile a ship repair and maintenance plan for the next 30 years of its fleets’ lifetime. The news of the U.S. Navy’s $23 million 3D printing allocation is especially heartening considering the U.S. Bureau of Industry and Security‘s (BIS) recent proposal to add further restrictions to the export of “emerging technologies.” In the most recent update on this proposal, several 3D printing industry stakeholders, including Stratasys, Boeing and Airbus, responded to the change with some concern about its effect on U.S. research excellence. Voting now open for the 2019 3D Printing Industry Awards. For all of the latest additive manufacturing news and updates subscribe to the 3D Printing Industry newsletter, follow us on Twitter and like us on Facebook. 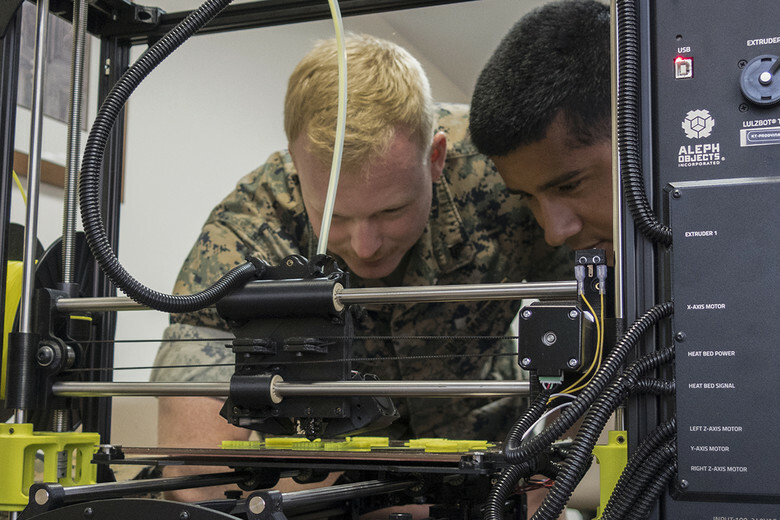 Featured image shows U.S. Marines training with Building Momentum to use 3D printers. Photo via LulzBot.